Is it the BEST accountancy software for your company? In this review we’ll look at Sage 50 Cloud and see if it’s the right accounting software for you and your company. Does it really help you save time and run your business more efficiently? The Sage Group began back in the 1980’s in the UK and since then it has come on leaps and bounds – even moving into the US sector and launching loads of business products – including Sage 50 Cloud Accounting. Now, I’m not going to lie, in the past, Sage did have the reputation as being the provider of comprehensive locally-installed accountancy software, which, shall we say had rather a steep learning curve, so when they released Sage 50 which is cloud-based, it made a nice change. So, Sage 50c is basically an offshoot of Sage 50, but what does the ‘c’ stand for? Well, Sage isn’t giving much away, but I believe that it stands for ‘cloud’. Maybe Sage isn’t linking the ‘c’ to cloud officially, because it isn’t completely immersed in it, its more like a hybrid, positioned between a traditional desktop tool and the ‘anywhere access’ via the cloud. Sage 50 Cloud enables users to run their businesses more efficiently and includes time-saving depth solutions to better manage invoicing, accounting, inventory, taxes, cash-flow plus loads more. It may sound amazing, but is it the right software for you and your business? 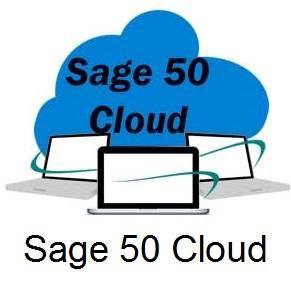 To help you make your mind, I have reviewed what exactly Sage 50 Cloud has to offer including as well as who it is suited to. I will put Sage 50 Cloud through our rigorous testing and will look at the following aspects. How does Sage 50 Cloud perform and what features do they offer to help create the perfect accounting solution? Does Sage 50 Cloud offer everything necessary that users expect from an accountancy solution? Does Sage 50 Cloud offer quick customer support solutions and help, and can users count on them when it matters most? Does Sage 50 Cloud offer the best pricing in the marketplace? And more importantly, what deals are available that can help users save money? Sage 50cloud is a well-rounded small business desktop accounting solution, which is more than capable and incorporates a comprehensive set of customization options and features that include basic cloud functionality. It has unusually strong inventory-management tools but has no functionality for web or mobile clients. Sage 50 Cloud does come in rather expensive compared with other software. It offers less but costs more. Sage Business Cloud Accounting is overall well-organized but can be a little difficult to navigate at times. Some parts of the user interface could be significantly streamlined; however, the features are there and predominantly that’s what counts. ​Overall, the Sage 50 Cloud customer service is good. The in-software chat support provides quick solutions to most accounting questions as well as various other support options. Is Sage 50 Cloud the right accounting software for you? It should be made clear from the outset that Sage 50cloud is an accountant’s program. It is not really designed for business owners unless they happen to have a pretty solid background in bookkeeping. For non-accountants the learning curve is steep, and the interface is, well pretty bland. 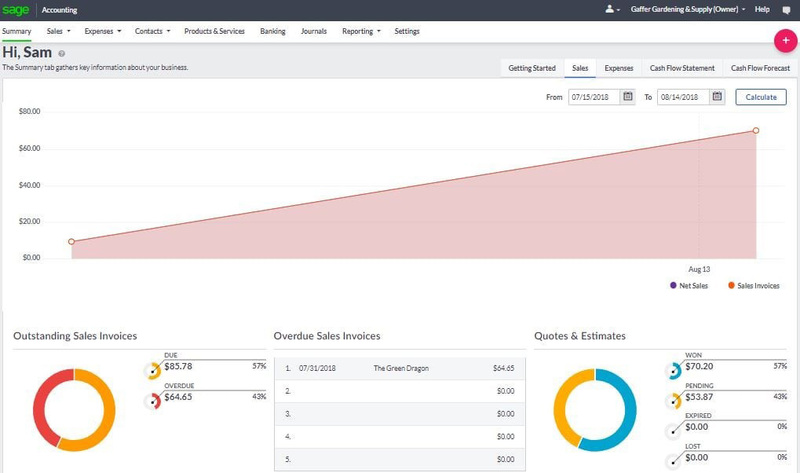 But, having said that, in return, you will get loads of highly customizable options, inventory management, comprehensive reports, and great job costing capabilities – all at a level that, as yet, just isn’t found in cloud-based software. One of the greatest downsides of Sage 50cloud is the price. At first glance it looks pretty on par with its competitors but when you look closer and reality hits that these prices represent a 70% discount (and then only for the first year of service) it so quickly looks extremely expensive. On top of its hefty price tag, Sage 50cloud also lacks some of the convenience of cloud-based systems, which really means that small business owners who have fairly simple accounting needs are most probably better off looking somewhere else. Sage 50 Cloud has a nice selection of both features and automation and is constantly improving. What makes Sage 50 Cloud rather unique is that instead of a dashboard it has a ‘summary’. The accounting plan is comprised of four distinct summary plans which include expenses, sales, cash flow forecast and cash flow statement, with the expense and important sales information located on the summary page itself. Each of the summaries includes graphs and charts so that users can easily see all the important information regarding their business. I really liked the cash flow forecast feature as it’s always useful to know how much cash you’re likely to have in the future!! Sage 50 Cloud’s invoice templates are rather basic, however, there are loads of customizations. Logo’s can be added colours changed as well as font sizes and fonts. Users have the option to invoice for both services or products as well as the capability to print packing slips or create credit notes. 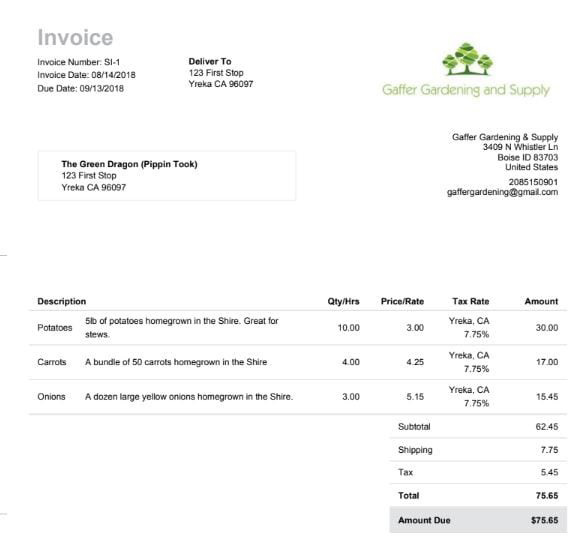 Invoices can be printed or directly emailed to customers. Set-up for recurring invoices isn’t possible, however, they can be copied, and past invoices can be duplicated. One of the features that I really love is that Sage 50 Cloud does actually differentiate between quotes and estimates – something which most other software doesn’t do. Both documents can easily be converted into invoices and also allows for default conditions and terms. Do you want to know the best bit though? I mean, just how cool is that!! 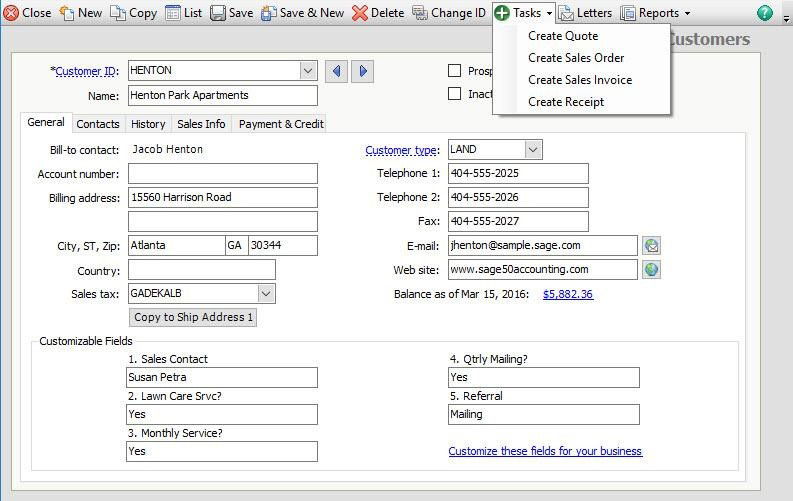 Sage 50 Cloud has a superb customer section where users can include traditional contact information together with customer notes. Credit limits can be created for each customer, default tax rates added, default pricing set and statements easily sent to customers. Payment details can be stored directly in Sage and if all that wasn’t enough, the accounting plan also includes vendor management. Phew, is there anything it doesn’t do? 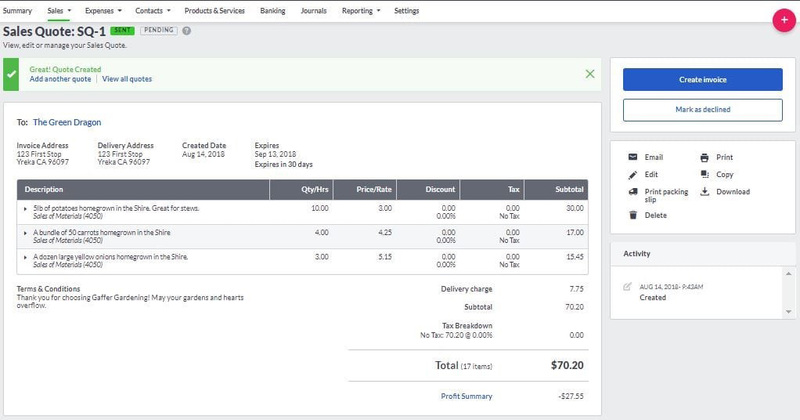 Users have the choice to either directly connect with their bank or to manually import their bank statements to the software. No actual bank rules can be set; however, the software is able to remember past transaction categorizations. It doesn’t include automatic transaction matching or duplicate transaction detection, but users will find it really straightforward to reconcile their bank accounts. Sage 50 Cloud provides a nice comprehensive chart of accounts which are fully customizable, and it is simple to add vendor bills into the software, but not as easy to see when the bills are due. To do this, users have to search for the due date as there aren’t any automatic reminders and Sage 50 Cloud doesn’t have the capability for direct payments to be made from the software. 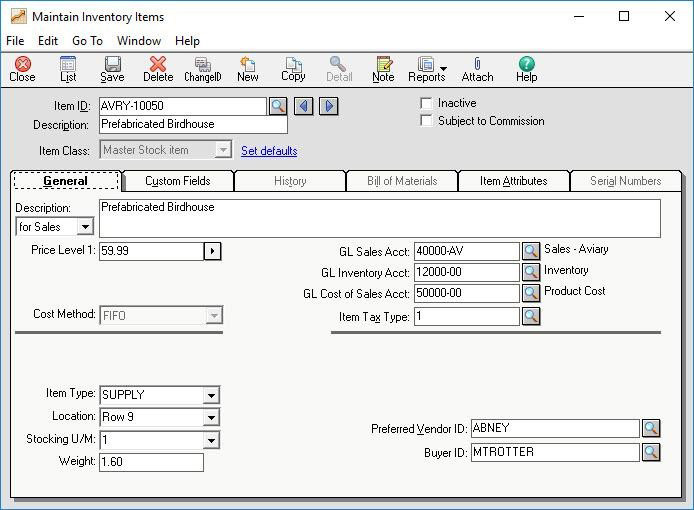 Previously, Sage 50 Cloud offered a basic item list, now, though it includes a full-blown inventory feature. Both inventory and non-inventory products can be added as well as services. I’m not going to lie but this cloud-based accounting software has some of THE most advanced inventory that I have seen so far. Users can add detailed information such as barcodes, locations and usual vendors and low inventory reminders and re-order points can easily be set. 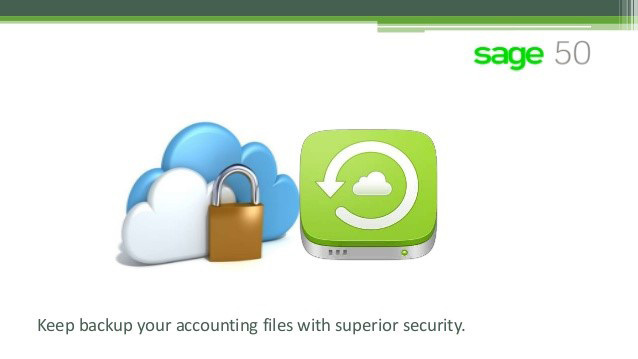 With Sage 50 Cloud the accounting start plan includes 15 reports and the accounting plan 23. All basic accounting reports and covered and can be customized as required. Specific reports can be marked as favourites and exported via .csv or .pdf. Default email messages allows users to set default email messages for credit notes, estimates, invoices and lots more. 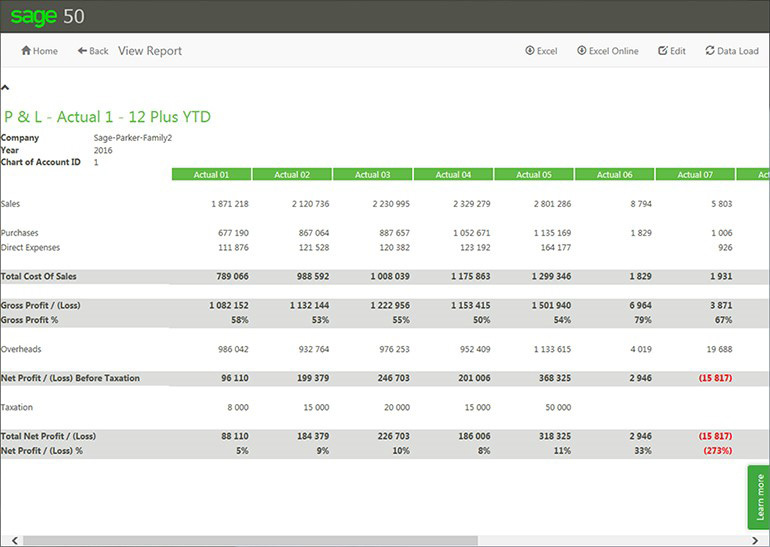 ‘Analysis Types’ enable users to categorize and track their data in Sage 50 Cloud. It helps users to better understand their data and in turn create much more detailed reports. 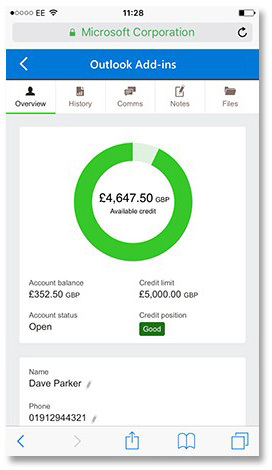 Cheques can be printed directly from Sage 50 Cloud and journal entries created – although it should be kept in mind that once created, the adjustment is quite difficult. Attachments can also be added to these journal entries as well. Unlimited sales tax rates can be created, and default sales tax rates can be assigned to products and customers. Previously, the software pulled in the sales tax rates via the customer’s address, however, this feature has gone, which was disappointing. Sage 50 Cloud does support multi-currency and is compatible with over 30 currencies as well as using live exchange rates. Most important information can be imported into Sage 50 cloud as well as reports and data exported. Sage 50 cloud also has an API available for any developers amongst you. Verdict – Sage 50 Cloud really is a well-rounded small business desktop accounting solution, which is more than capable. It includes a comprehensive set of features and customization options, including basic cloud functionality. It has unusually strong inventory-management tools and comprehensive reports at an extremely high level. 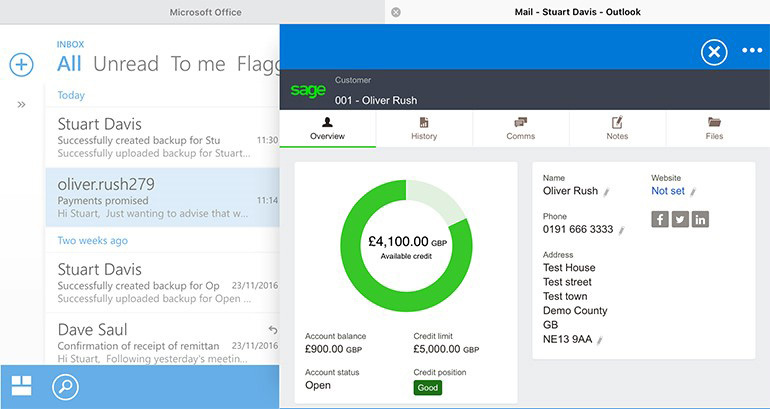 Sage 50 Cloud offers a modern and beautiful user interface which is easy to use and extremely well organised. The software doesn’t take too much time to learn and there are shed loads of built-in options to help, which also includes a guide to getting started. 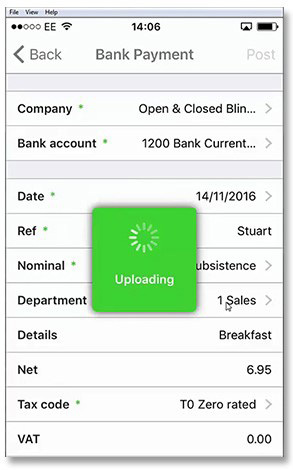 Now, when launching into Sage 50 Cloud, the app will open to the Business Status section, which is good, to begin with. This gives the user an in-depth view of the financial health of their company. The tables and charts will illustrate the current state of the account balances as well as aged receivables. Users can easily see vendors that need paying as well as those that are owing money. Scattered around the page are links which will direct to underlying task screens and detail. The programmes primary function areas are represented by tabs on a vertical toolbar which is located on the left-hand side and include Inventory & Services, Customers and Sales and Banking – all of which work equally. Navigation can be simplified by customizing the shortcuts under the toolbar and can include the most used screens. For instance, if a user were to click on Customers and Sales, a button on the left-hand side will be displayed which is labelled with tasks. These are arranged in a similar style to a flowchart and illustrates a typical work pattern. Many have a small down arrow located in the lower right when clicking on this a list of subtasks will be displayed. By clicking on the ‘customers’ arrow several activities will appear including ‘write letters to customers’ and ‘new customer’. To open more complex tasks, click on the ‘jobs’ icon. This is where jobs can be created as well as cost codes built. The remaining buttons on this navigational/graphical chart are to do with types of transactions that are related, like ‘time and expense tickets’, ‘customer statement’ and ‘sales invoices’. Customer links are displayed on the right-hand side of the screen for customers and include a link to customer reports which have been recently viewed, FAQ’s and an aged receivable chart. Each one has a link which then leads to expended information, then opens a new window. By clicking to view a detailed customer list, a window will then open which contains links related to tasks including ‘create sales order’ and ‘view quotes’ as well as the list itself. Also included with Sage 50 Cloud is a standard Windows menu which runs vertically across the top – perfect for those who prefer using that type of navigation. The menu items will take users to screens which can also be reached via the programmes more graphical navigation tools. There is more than one way to reach most data screens and tasks when using Sage 50, which is great, providing that it is understood, and the correct path is chosen – things can get confusing when one believes that every single link is unique. 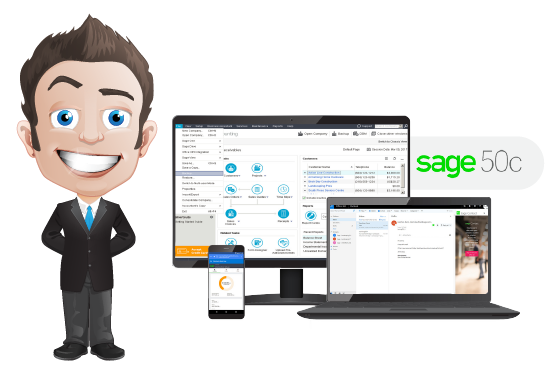 Verdict – Sage 50 Cloud does have a slight learning curve, but this is partially due to the number of features that it offers. The walk-through guide is superb though and ensures that users will be up and running in no time. Sage 50 Cloud comes with both iOS and Android applications which provide a ‘desktop’ feel for their users, who can upload any financial data using their mobile devices which is then retrievable from the cloud storage. On-the-go access to information such as clients balance information, credit limits and contact details as well as any other financial related history is provided as well as access to the platform itself – anytime and from anywhere. Now, I did read reports of mobile app crashes mainly with Android users who did report limited functionality and bugs but am told that this is something that Sage 50 Cloud is actively looking to rectify. When Sage 50 Cloud was first launched there was one major setback – and that was that only one user was able to access the accounting data from within the cloud at one time, basically locking out any other users. Now, however, with the different price scales, this has been rectified which is great news – it does however come at a cost. I inquired with Sage 50 Cloud how much a multi-user licence would be for 3-5 people and was quoted £132-50 plus VAT – not cheap by any means. Verdict – Sage 50 Cloud is cloud-based and does offer mobile platform add-ons for both Android and iOS devices (although Android may need a little more work), allowing users to access data and carry out accounting, whenever and wherever. It also includes licences for multi-users, which can be quite expensive. What I love about Sage 50 Cloud accounting software, is that it integrates seamlessly with Microsoft Office 365, which then provides employees and business users, within a company access to a platform of extensive proportions and which also work nicely with other applications like PowerPoint, Outlook, MS Word and Excel. Additionally, Sage 50 Cloud also integrates with various accounting solutions including BizOps mobile, accuCOUNT, Sage 50 Payroll, Time Tracker, CoreIMS, ProTrack Warehouse plus loads more. What this does is it allows the users of Sage 50 Cloud to increase their businesses internal resources while allowing their employees to increase their productivity when carrying out other business processes or when creating budgets. Sage Pay allows users to accept customer payments over the phone, in person or online, meaning that payments can be effectively managed. Sage Pay accepts all major payment types and slots in perfectly with Sage 50 Cloud. Users also have the ability to manage their finances from one viewpoint- which makes life a whole lot simpler. 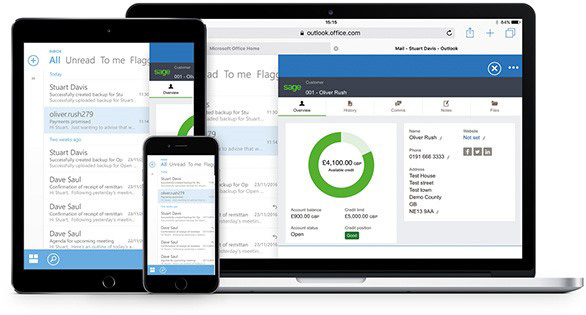 Verdict – The icing on the cake here, is Sage 50 Cloud’s integration with Microsoft Office 365, which gives users a huge amount of choice. It also integrates nicely with other accounting solutions and works beautifully with Sage Pay to help users manage payments more efficiently. One thing that I consider to be really important when testing and reviewing different types of software is what support is available and what shape and form it comes in. After all, we’re all human and need help at some time or another and I want to know that when (not if!!) I need it, that it isn’t too far away. 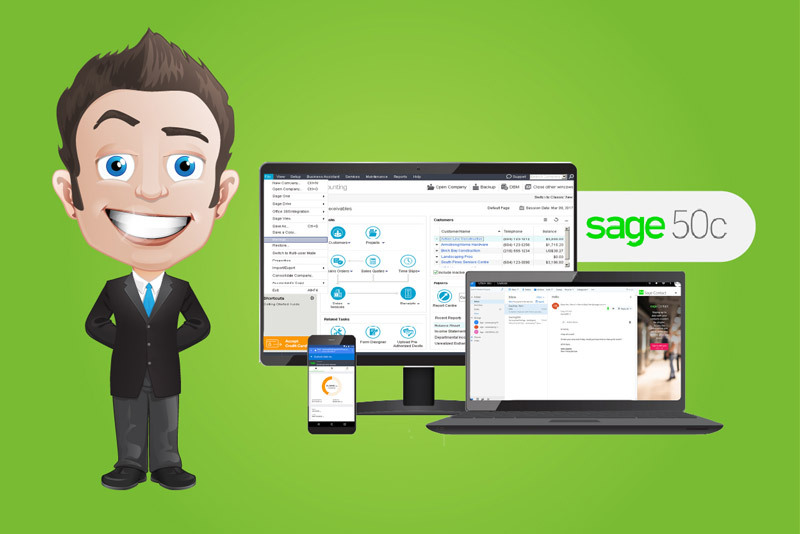 Sage 50 Cloud offers some fab in-software options which include live chat and a help centre. I found that the live chat reps were extremely helpful and nine times out of ten, my question was answered quickly. For those of you who like speaking to an actual person – and there’s no nice way to say this – you can’t!! Sage no longer offers email or phone support, which I must admit I was disappointed about. Help Centre – Sage does have a help centre which is packed with loads of how-to articles which can be easily accessed from directly within the software. Chat – This is an in-software chat feature which is helpful and prompt and was my choice of go-to support. Sage Knowledge Base – This is a knowledge base (obviously!!) which allows users to search past customer inquiries as well as Sage’s resources. Community Forum – Sage 50 Cloud does have a community forum where users can ask fellow Sage users questions, as well as access help articles. Sage University – Now, extra fees do apply here, but its where users can search for Sage training courses. Sage City – This is where users can hear about Sage’s latest announcements, ask questions to other users and look at the recent blogs. Feedback Form – Users can provide feedback with this specially designed form directly within Sage 50 Cloud accounting. YouTube – Well, Sage doesn’t have a YouTube channel. What I found was that there weren’t many videos around Sage 50 Cloud and what I did find was mostly geared around customer success stories and business advice. Social Media – Sage is active on Instagram, Facebook, LinkedIn and Twitter. Sage Blog – Now this isn’t specific to Sage Business Cloud Accounting, BUT Sage does have a blog which features loads of insightful guidance and business advice. Verdict – So, although Sage 50 doesn’t offer email or phone support, it more than compensates by offering loads of other options for help and support. Perhaps a YouTube channel is something that Sage 50 Cloud could consider as something for the future?? Everyone loves getting a ‘little extra’, whenever they’re buying – it just makes life a little bit sweeter. What I wasn’t too impressed with, was that Sage 50 Cloud wasn’t very forthcoming with security information. I had difficulty finding any on their site, but thankfully, most reps were able to provide the security details. Sage 50 Cloud uses 256-bit SSL encryptions as well as multi-factor authentication to protect their user’s data and data is monitored 24/7 and hosted by Amazon Web Services. Because Sage 50 Cloud is software that is cloud-based, this makes it compatible with almost any device. For the best experience though, Sage does recommend using the most up to date internet browsers. Now, this isn’t completely new, as it has been available via an optional add-on for quite some time – and depending on what country you are in, it is still delivered this way. However, for regions that are selling the integrated Sage 50 Cloud product, this add-on is now standard. It requires no additional set up, simply navigate to the ‘My apps’ folder located in Office 365 and select the Sage Intelligence app. Sage Contact is an add-in to Microsoft Outlook – now don’t go thinking that all it does is synchronise customer contact details – believe me it goes beyond that. 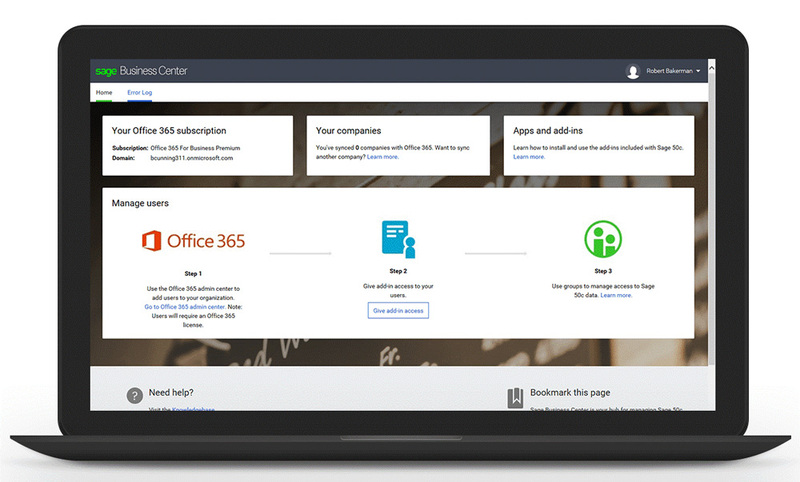 What it does is associate Outlook contacts with key Sage accounts data and then make it available to Outlook users both on mobile devices and desktop. The image above illustrates how it would look using an iPad. Accounts data is able to be accessed via Outlook and edited without having to leave the app – pretty much the same as with the Intelligence Reporting add-in, although keep in mind that it is generally limited to the creation of new accounts on the go together with the updating of any non-essential information, for example, contact details. Last but not least is Sage Capture for smartphones. This is designed to capture and upload pictures of expense receipts or other paper documentation together with manually supplied details in order for the associated transaction to be directly posted to Sage 50 Cloud accounts. This app is available for smartphones, but at the time of writing not for tablet devices. It enables users to view their top-level sales, bank balances, purchases and profitability and contacts can be emailed, called or texted directly from the inside the app. It helps users to understand their profit and loss and no expertise is required as it is easy to use – perfect!! Verdict – Sage could be a little more open about their security, but having said that, maybe they feel that it would compromise it. Hopefully, the tracker app will be available for tablet devices in the not so distant future. Of course, Sage 50 Cloud is not going to be the right accountancy software for everyone, so let’s try to get down to who precisely this tool is going to be suitable for. For those watching the pennies or on a tight budget, Sage 50 Cloud isn’t the perfect match. It is geared up towards small to medium businesses and can come in more much more expensive compared to its competitors, while at the same time offering fewer features. For small to medium-sized businesses and set-ups that don’t require project management or time tracking, Sage 50 Cloud is definitely accounting software to consider. It offers the robust nature of the Sage desktop software but with cloud functionality. It has various payment plans which means that there is one to suit most user’s needs and the fact that the Accounting plan offers customisable user permissions and unlimited users is an added bonus. I do believe that high-level businesses could fit in nicely with Sage 50 Cloud. It is flexible enough to fit in with a wide range of businesses and is perfect for light inventory, distribution and retail sales. Remember though, more advanced features may require integrations and add-ons. Well, that’s it I’m now nearing towards the end of this review and I hope that it has given you an overall idea what Sage 50 Cloud has to offer. I’m guessing though that the final and most important question is – Is Sage 50 Cloud THE ONE, I mean, the software for YOU and your business? Sage 50 Cloud accounting software offers improved integrations and invoicing, advanced inventory features as well as a feature for cash flow forecasts as well as loads of automation. The UK version, in particular, is well developed. An added bonus is their customer service and reporting – the live chat is one of the best that I have seen) and the accounting plan offers unlimited users – something which is few and far between with its competitors. Although Sage 50 Cloud does compete with its competitors, it doesn’t necessarily make it a winner – not when features such as time tracking and project management are still missing. The Accounting Start plan is limited and more is on offer from free software such as Wave. Having said that, this type of plan could be suitable for small businesses that don’t require loads of features and these could outweigh the cons. Well, why not take advantage of the free trial and give Sage 50 Cloud a spin and see if it is the perfect match for both you and your business. Are you still unsure whether Sage 50 Cloud is the accounting software for you?